All the breweries pouring at Mash Tun Fest: New Brewer’s Bash. The Mash Tun New Wave Brewer’s Bash was a celebration of the exciting young breweries growing in the current craft beer boom. The spotlight was on the welcoming nature of the community felt amongst these breweries that have all recently experienced the struggles of starting a brewery in a crowded scene but feeling the success of making a name for themselves even if only amongst an expanding base of loyal drinkers. It was one of those events where the brewers seemed just as excited to be there as the crowd, and the laid-back party feel was comfortable and inviting. In addition to the beer, perks included tamales and BBQ pork; bowls of peanut butter-filled pretzels and popcorn, and the gloriously simple cheese and cracker plate which we revisited at least a dozen times and openly celebrated when a fresh cheese tray was brought out to replenish the supply. Free copies of the Mash Tun Journal’s latest issue were available, featuring a variety of craft beer perspectives and even profiles of many brewers featured at the event. Even though the laid-back atmosphere and convenience were two of the highlights of the whole event (despite a bit of a bathroom wait), the spotlight was really on the brewers. 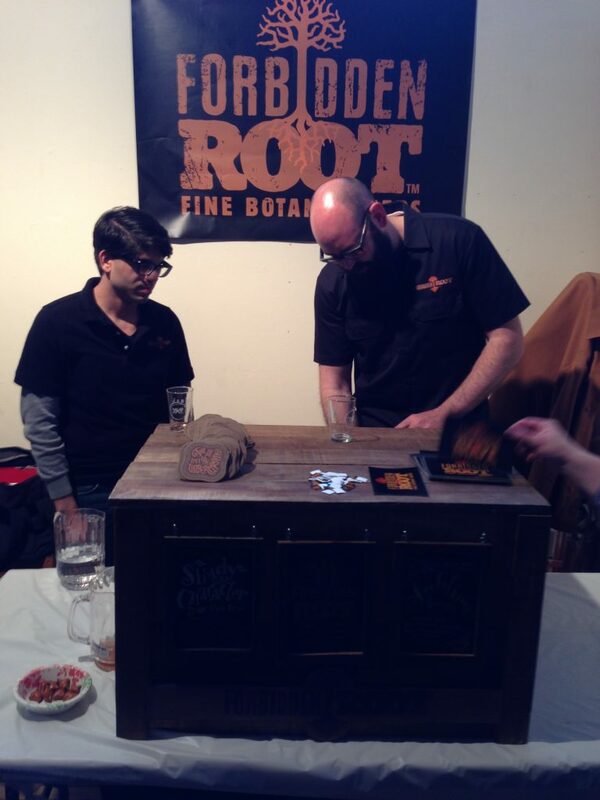 BJ pouring one of Forbidden Root’s offerings. A little over a year old, this brewery specializing in using various roots and botanicals brought some of the highlights of the whole fest. The Sublime Ginger is a “wheat ale brewed with ginger, key lime, honeybush, and lemon myrtle.” Effervescent with bright and acidic citrus flavor on the front, it finished crisp and easy like a ginger ale. If they put this out in cans or bottles in an accessible format, this beer will be filling space in a lot of portable coolers this summer. (Please do this.) The next beer was the eponymous Forbidden Root that had definite molasses and sarsaparilla root flavor, but fortunately came off balanced rather than overly sweet like some of the recent alcoholic root beers that have been released. The secret tap tucked in the corner was their Divine Mud stout with a bitter cacao nib front end with a darker, sweet chocolate finish across a medium body. It was the lesser of the three, but it was an incredibly strong showing from a brewery that every Chicago beer drinker needs to get excited about. 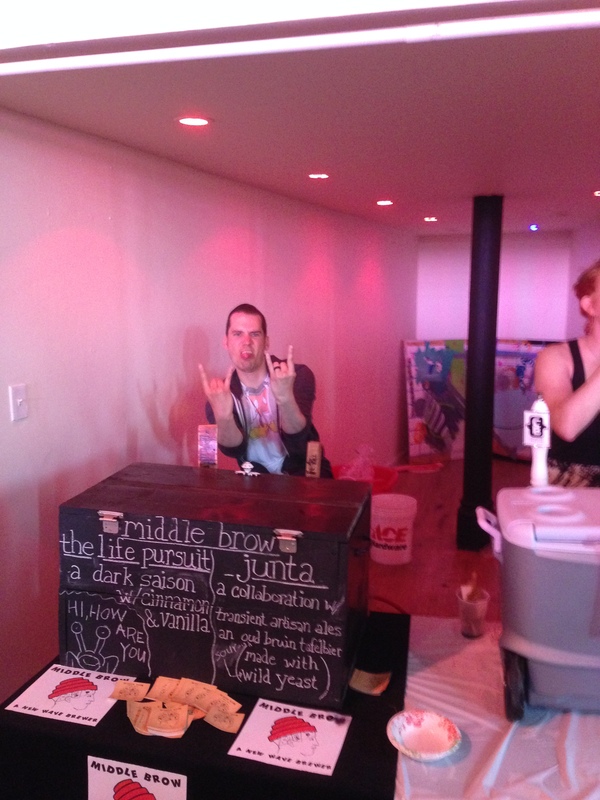 Nick from Middle Brow submitting his resume to Three Floyds. Contract brewing out of Zion but looking for a more permanent space, Middle Brow is one of the more interesting brewery models we’ve come across (which we’ve covered at length during our glowing review of their first bottled beer, “The Life Pursuit”). They embraced the event theme with small posters of their Middle Brow head profile logo wearing an Energy dome (Devo hats, some might call them). Their collaboration with Transient Artisan Ales, Junta, is an oud bruin table beer low on ABV (3.5%) made with wild yeast, which added a slight sour tingle and a dry finish to compliment the faint dark cherry sweetness. Nick Burica, one of the brewery’s principals, was animated and enthusiastic when talking about their future plans, despite having to wade through the inevitable red tape. In anticipation of Chicago Craft Beer Week, they’re brewing a strong blonde with a unique blend of yeasts that my alcohol-damaged memory couldn’t come up with for this sentence. In time, we’ll see more bombers from homebrew competition winners and 4-packs of Middle Brow’s own creations. 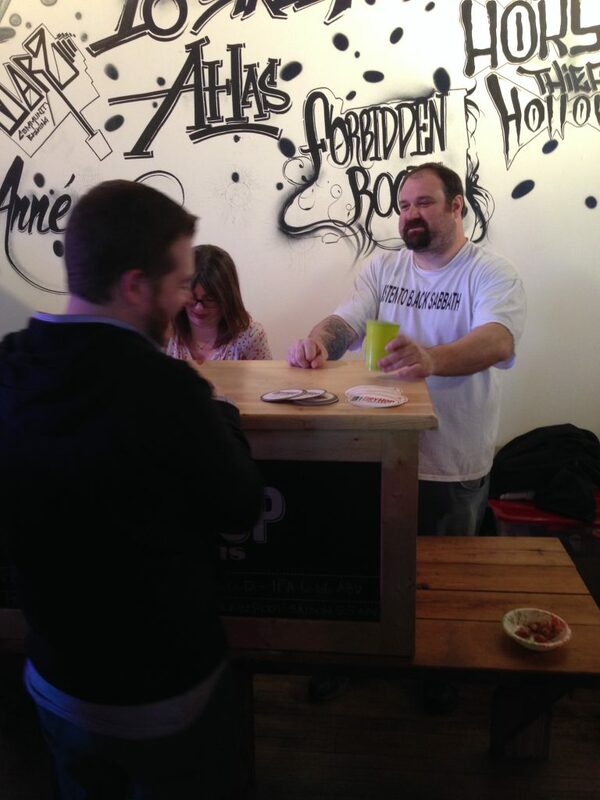 Jerry Nelson pouring Austere and Maya (in that sweet shirt!). If you haven’t heard us rhapsodize over what Une Année is doing, then you must have missed this episode…or this episode…or this one. Founder Jerry Nelson was pouring Maya (Belgian IPA) and Austere (saison) and wearing the exact shirt Craig and I described wanting to own in one episode (they’re not for sale – they only made about 4 of them). The Austere tasted more complex than I even remembered, with notes of orange peel, white peach and red grapefruit balanced with a peppery yeast. It’s still remarkably light and drinkable. The Maya had some bubblegum sweetness and a similar spicy yeast finish, but it was accented by a floral hop bite. It’s generally a good idea to drink Une Année whenever it is available, even if you’ve had it before. Jerry said that the Less is More session saison should be returning sometime soon, but we’ll have to wait a year until Citra hops are thrown in the brew. 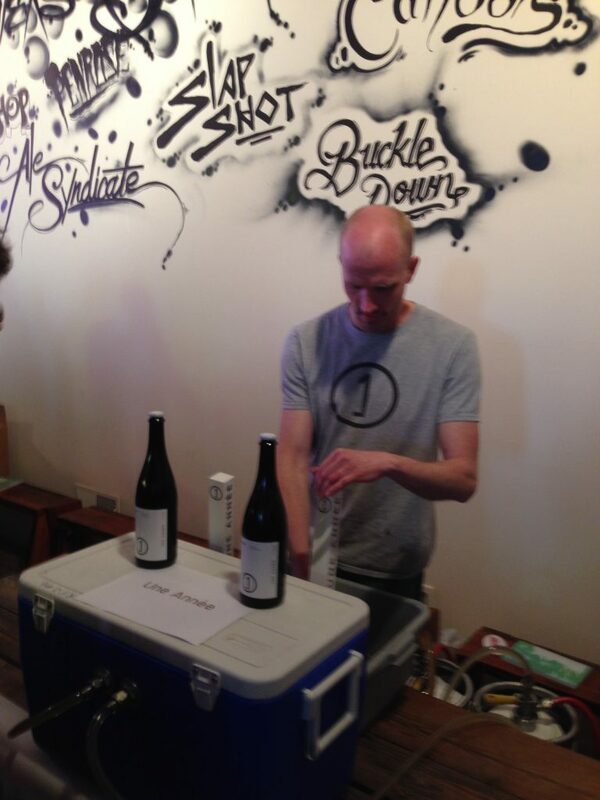 With the most unassuming setup (pouring from a cooler with no elaborate tap handles), Lake Effect brought two tart Brett beers that cut through any threat of palate fatigue setting in after two hours. The Brett Framboise was raspberry forward with the right amount of sweet and pucker. The Pamplemousse was the grapefruit-featuring version of the same base beer, and it increased the sour acidity slightly but was still delicious. These are beers made by a brewery that knows what the hell it is doing, even if they’re operating out of the back of a costume shop. Barrel-aged brettanomyces beers are in the near future, with plans to rest some of their more sour offerings in wine barrels. They were a bit under my radar before, but they’ve got my full attention now. Brideport’s own Marz is a project of Ed and Mike Marszewski, co-owners of Maria’s Community Bar & Packaged Goods, and Ed is the publisher of the Mash Tun Journal. The Bubbly Creek Berliner weiss was acidic and tartly sour that made my jowls tingle and salivate, which was much appreciated. The Albino Berzerker White IPA collaboration with Lake Effect had Mosaic hops by the ton just jumping off of this thing, with that almost savory mandarin glaze and grass flavor you would get in the Chillwave from Great Lakes. Their DryHop collaboration, Arnie Palmer Meets the Dragon Lady, was a well-balanced APA. I was hoping there’d be more of a lemon and dragonfruit presence, but I may have missed it because I was about 15 beer samples deep at that point. Ryan getting one of DryHop’s offerings from Brant Dubovick. This was my first experience with DryHop, a brewpub operating on the North Side.In a fest with a lot of hoppy pales and zesty saisons, they brought some of the standouts. The Blast in the Underworld IPA was sharply bitter but had a clean malt profile that made it very drinkable. The 93’ Til Infinity saison was appropriately chill, featuring dandelion root and rye malts to bring spicy, herbal, and floral flavors. DryHop is presenting itself as a serious contender for must-visit brewpub over Revolution, if their food is truly as good as advertised. I look forward to getting up there soon. OTP was on our radar from FOBAB with their Kentucky Mountain, a bourbon barrel aged old ale that tasted like a booze-soaked chocolate and caramel bar. Brome, a saison, was a little too sweet at first but had a nice, musty phenolic quality that gave it a farmhouse feel. Their real winner was the Warlander, a huge 10% DIPA (or Triple IPA, according to their website) that may have been my favorite beer of the fest. While many of the beers at the fest played in the delicate territory, this one is a full out assault of bitterness and gigantic tropical flavors, leaving a stinging bitterness on the back of the tongue for some time. The ABV is well-hidden, but not so much so that you’d be able to throw this one back with ease. This is built for tasting, and I really hope we get bottles of this one in the near future. 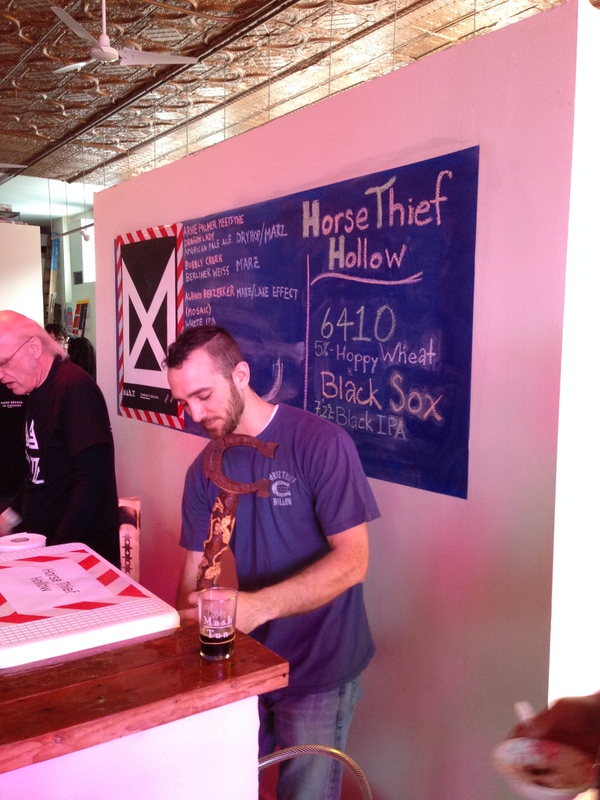 Andy pouring Horse Thief Hollow’s Black Sox IPA. Named after an area in the 1850s where stolen horses from Missouri were hidden, Horse Thief Hollow is certainly unique – they are the only brewery at Mash Tun located on Chicago’s South Side. Crafted by head brewer Dave Williams, their Black Sox black IPA was medium-bodied with roasty, almost coffee-like malts and a good balance of fruity hops. They also brought a rye saison called Better Things To Do, which is aged on ash and maple, which Craig had at the height of his palate fatigue. Having forgotten to eat a couple dozen tablespoons of active yeast before the event, I was not able to sample from every brewery. There were a few other highlights, like the Cahoots No S’more stout, which was very similar to the amazing DinoS’mores from Off Color. Speaking of, I had a pour of Off Color’s Apex Predator, which has quickly become a staple saison for me. Unfortunately, we missed out on BuckleDown, Ale Syndicate, Atlas, SlapShot and a few others – many offered beers we’ve already tried and enjoyed, or we simply ran out of sobriety before we got to them. 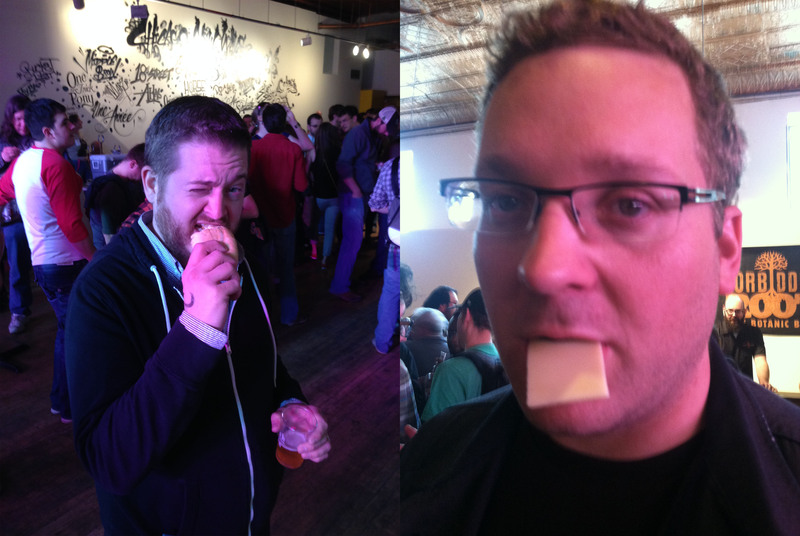 This is what happens when you let two idiots loose at a beer fest. Ryan (left) and Craig (right). Despite craft beer’s rapid growth and exponential acceptance with more drinkers, we may be in a period like the dot-com boom that eventually crashed, taking businesses and a significant chunk of the market with it. As every month passes, the taller the deck is stacked against the newest brewery opening. But what this festival proved was that we are happily in the boom period of craft beer, with so many of these small batch breweries growing and expanding into larger facilities or opening tap rooms. The current collaborative culture in Chicago craft beer makes it feel like an unpretentious (ok, mostly unpretentious) scene of passion-driving ingenuity, where there’s no “cool kids club” elbowing out the new arrivals. 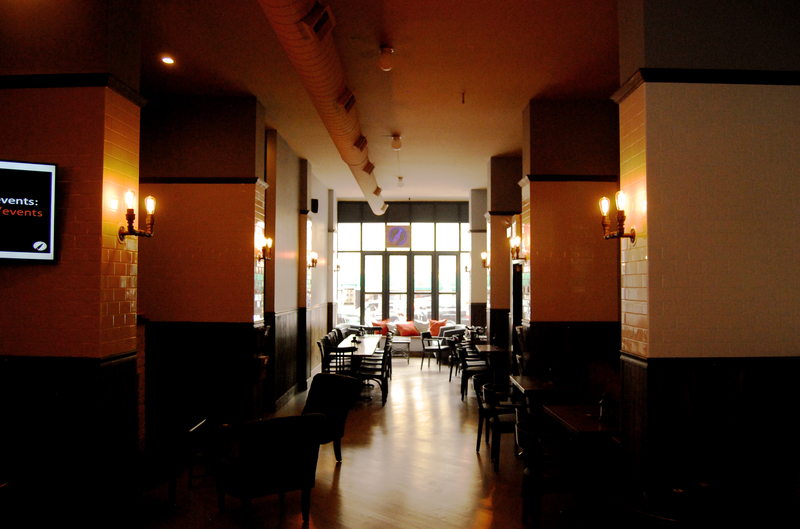 Some of our best recommendations for what to try came from “competing” breweries – and the laid-back atmosphere contributed to the communal feel. The festival was an example of how you run a craft beer event, where there was no presence of the sometimes self-important presence of veteran breweries. Mash Tun is for the children! A refreshing change of pace, this event brought the community vibe and gives Chicago beer drinkers even more to look forward to. Well done, Mash Tun. 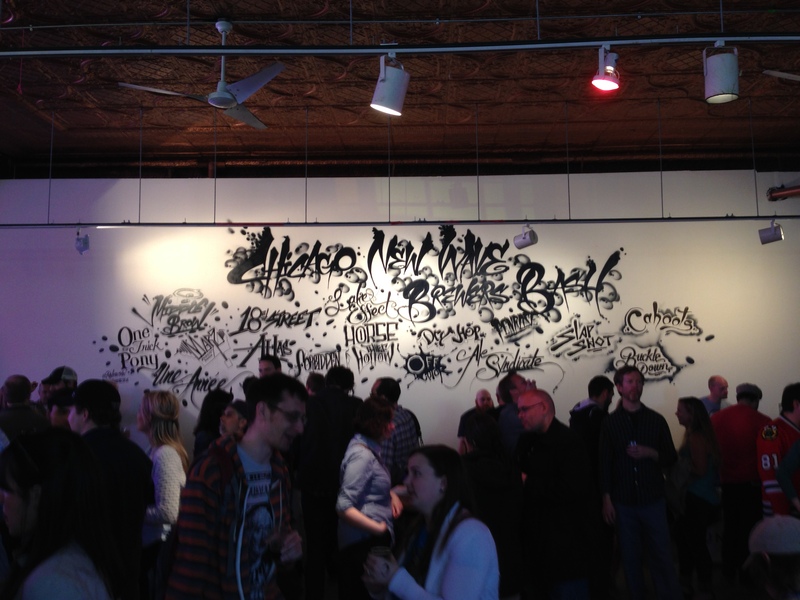 Panoramic of the Mash Tun space – crowded, but not overly so.